World Crafts Council – Australia is a ‘third wave’ national craft organisation. WCC-A attempts to fill the gap between the state-based organisations in an agile use of social media by returning to the grass-roots in reflecting the culture of our crafts beyond state and national boundaries. Fifty years later, it has the capacity to operate in a more agile fashion, using the many social media and collaborative tools of the 21st century. 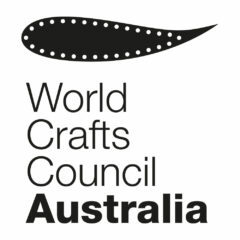 World Crafts Council – Australia is the national entity representing Australia in the World Crafts Council. Australia is a member of the South Pacific sub-region, which is part of World Crafts Council Asia Pacific. WCC-A continues a 50 year journey connecting Australia with the world of making. The Crafts Council of Australia was established in 1964, the same year as the World Crafts Council. According to Grace Cochrane, ‘The WCC was formed at a time when Australian craftspeople were seeking links with one another, and needing to make more contact with others overseas. It not only provided information and firsthand experience of other places and other ideas, and important links with people who would come to teach, lecture and bring exhibitions in the 1970s, but also reinforced a common feeling of purpose and value that had a significant effect on the strength of the organised movement which developed in member countries.’ (p. 112). The prompt for an Australian organisation was an invitation to ceramicist Marea Gazzard to attend the first World Crafts Council conference. To be an active part of this international network, it was felt that Australia had to develop its own national body. Marea Gazzard eventually became the first popularly elected President of the WCC, reflecting Australia’s active involvement during the 1970s and 1980s. This formal link was broken when Craft Australia was re-structured in 2000. The Craft Australia that subsequently re-located to Canberra was largely limited to promoting the work of other state-based organisations before its closure after de-funding in 2011. The World Crafts Council continues to play a positive role in Australia. It provides many opportunities to attend its exhibitions, workshops and conference. The Asia Pacific network in particular gives Australia privileged access to the leading craft organisations in our growing region. But just as in 1964, when it inspired the creation of a national body for craft, so today it offers a framework for a renewed dialogue across our broad continent and its islands. As it began in 1964, the journey now returns to the dedication of individuals and groups who believe in that the strength of a culture is in what it makes. Please join us in a renewal of this vision. The World Craft Council is the umbrella organisation of five regional associations (Africa, Asia Pacific, Europe, Latin America and North America), within which are various sub-regions. Historically, Australia and New Zealand have been in the South Pacific sub-region of the Asia Pacific region. The WCC General Assembly meets every four years. Regional groups meet annually. In 2008, the Pacific Craft Network was established as a means of disseminating information from the World Craft Council to the island communities, as well as providing a platform for development of projects particularly in association with the Pacific arts festivals. You can also read this report on craft in the South Pacific 2012-14. Cochrane, Grace. 1992. The Crafts Movement in Australia: A History. New South Wales University Press. Very pleased to be involved in this vital organisation. The site looks brilliant – very attractive indeed, and most informative. Good morning. We are from Green Universe Environmental Services Sociey (GUESS) NGO, Hyderabad, India. We are planning to develop a theme park by name ethnic village in 100 acres consisting of Eco Tourism, Natural Dyes Processing, Handlooms, Handi Crafts and Traditional Ethnic arts from different parts of the world. We are inviting you to be part of our initiative and we can explore opportunities and exchange ideas. The site is great, thanks for the updates on wcc.